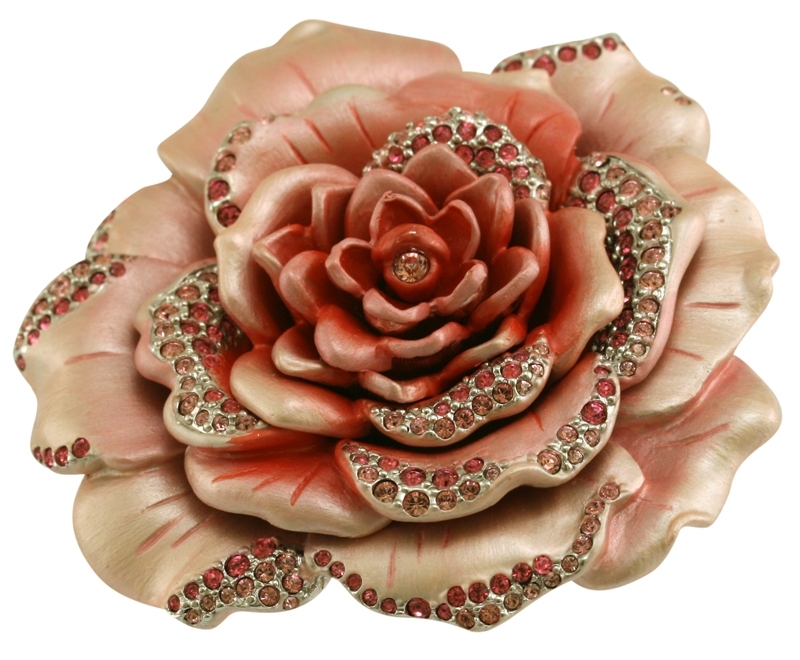 This brooch is based on the Rosa centifolia- This rose is a complex hybrid developed by Dutch breeders sometime before the 19th century. It is particularly used in the perfume trade, as it especially valued for its singular fragrance which is sweet and clean, with high notes of honey. This rose is inspired by artwork by Pierre-Joseph Redouté (1759-1840). The floral works of Redouté have a great reputation for their beauty and accuracy. He began his career as a scene painter in Paris but his real love was flower painting. He was found painting in the Jardin du Roi by the wealthy botanist Charles Louis L’Hértier de Brutelle who became his patron. Redouté was introduced to the royal household and was appointed Draughtsman to the Cabinet of Marie-Antoinette. After the revolution Joséphine Bonaparte became his generous patron. She spent untold sums on the publications recording her rare and exotic plants which contributed directly to Redouté’s most magnificent volumes Les Liliacées (1802-16) and Les Roses (1817-24).